The annual Hunter Ukestras Showcases celebrates what each local Ukestra celebrates each week – our fabulous communities which enjoy learning how to play music together on the ukulele. This page is a compilation of videos of the performances of some of the nine weekly groups that meet in various pubs and clubs in the Lower Hunter. The second Showcase was held on Sunday 13 December at South Newcastle Leagues Club Function Room. Warning! These videos were taken and posted by various friends and family. Take them for what they are, lovingly recorded mementoes of the day, not necessarily your classic Cecil B. De Mille production. We only have videos of what people have sent to us. If you know of anymore videos or photos, please send them on. Thanks to Danielle, Martin, Christine, Pam, Kiri, and the myriad of people who helped make it happen. 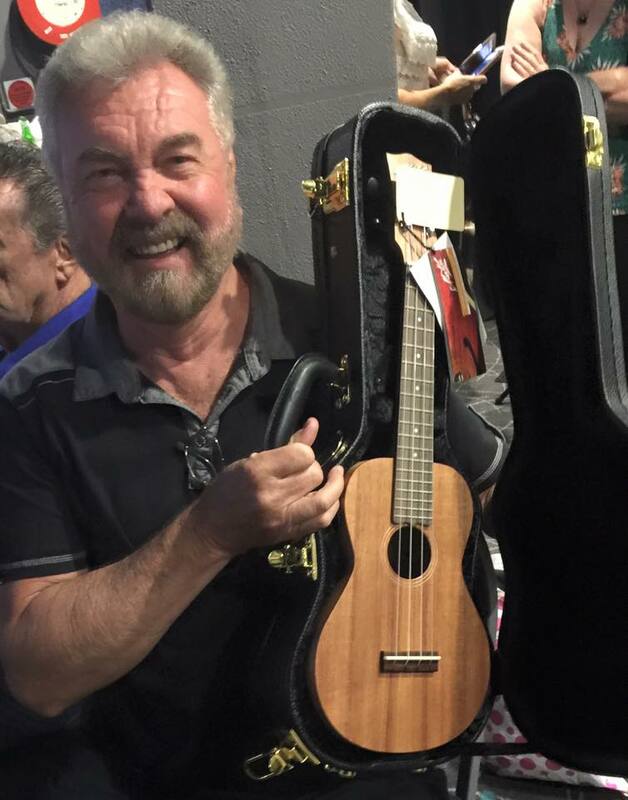 And who won the Maton Uke raffle? See the end of this webpage. We inspired a short story! Do you wonder what is the essence of what we enjoy? A couple of weeks after the Showcase this short story appeared in the Newcastle Herald. It was directly inspired by a friend of a Ukestran attending the showcase. It really is a thoughtful and wonderful piece. We hope it wins the competition! Have a read, it only takes about 5 minutes but is quirky and joyous. The Pluckers seem to be the bad boy n girl ukers of the valley. They meet each Monday night in the Paterson Tavern over a beer, Pims or lemonade. Their performance of Aged and Mellow totally brought down the house. Sung by the squeakily sultry Cate Green, the 1952 song by Little Esther, was preceded by an hilarious introductory spiel by Bob Beale, and one false start. Thanks to Jeff Newman for the following videos. Jeff is a Wednesday morning regular and went to great trouble to record, edit and post the following videos. Thanks so much Jeff. Both of these performances features three part harmony singing from Lauren Horder, Cynthia Sleight-Meyles and Judi McLean. The Thursday nighters also are rather adept at plucking a good part. Jane Jelbart is the quite obvious musical director out the front. The Beatles classic is perfect for picking a part, or picking apart! Jane went to great effort to write out all the parts for this relatively obscure song by Beirut. Although originally a song featuring a mariachi-type brass section, it becomes a delicate picked piece under the iron fist of Jane’s direction. Danielle Scott has had a dedicated Wednesday morning following for some four years now. Blessed with good singers, solid strummers and expert pickers, the Wednesday Wanderers are a musically coherent bunch. Testament to their community spirit is the fact that many of them are also part of the Side-by-Side group who regularly perform at local nursing homes and service clubs. Elizabeth Glazebrook, Jeannie Jennings and Jeff Newman give a great rendition of the famous Kinks song. Long time Ukestran, Neil Weaver leads the singing on this well loved Elvis classic. This group has been meeting on Tuesday afternoons at Teralba Bowling Club for six years now. There has been a turnover, with new people coming in, and others migrating to other groups, to form their own groups, or just leaving! We were thrilled, a bit scared, and chuffed that David Tennant chose to make his ukestra singing debut, and boy did he impress, in two different singing voices, and with some of the best kazoo playing ever. His great work was complemented by a solid bunch of strummers and the lead picking skills of Rosalie Heffernan and Merrilyn McSporran. Jacqui Targett is a born performer. Her husband Neville suffers under the weight of miles of cupboards of fabulous dresses. Jacqui did us all proud with Fleetwood Mac’s famous song, Rhiannon. Stevie Nicks probably wouldn’t be too unhappy either! Unfortunately no-one has yet informed us of videos from Tomaree Ukestra or Tuesday night at the Merewether Bowling Club, or the 4 children’s groups that appeared. If you do know of any (or if you sent them but we lost them! ), please let us know and we’ll post them on here. Thanks to Bob Beale of Woodville for these two photos which we nicked off Facebook. If you know of more good photos, please send them through. The kids from Waratah had a little help from a younger sibling who needed a little extra encouragement from Jane. The Folk Club held a raffle of a rather speccie Maton Ukulele. It is always great when someone in the attending groups wins, and this time it was a very smiley Ray O’Connor from the Paterson Pluckestra. And finally, we got this really lovely email from Dianne. Says it all really! Wanted to say thank you to both you and Jane for yesterday. What a wonderful celebration of community! From kids to older folk all enjoying a common passion. WOW! I thought all the groups performed really well. The variety made it all the more enjoyable. Geoff Scott’s wife commented to me that she thought it was wonderful that everyone felt comfortable with expressing themselves just as they are. A lot of acceptance in the room… Nice. Let’s do it again soon. And again, thanks to all those who helped make it happen.